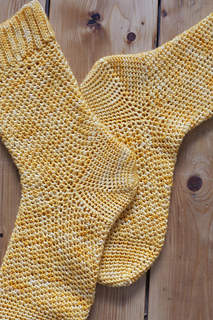 These socks are light and cool, using a cluster stitch they are really stretchy in the length. 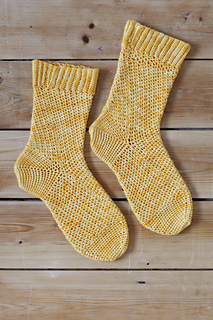 I used a yarn with bamboo content to make them perfect for warmer days. Worked top down a ribbed cuff is created by working alternating rows of half treble and double crochet stitches into the back loop only, before joining and working down the leg. 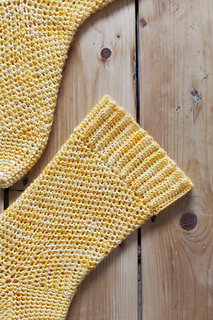 These are tube socks, a gap is left for the heel which is added at the end. Rnd 1: Ch1, 1dc, ch1, 1dc in next st, skip next st, rep from to end, join to top of first st with sl st, do NOT turn. Rnd 2: Ch1, 1dc, ch1, 1dc in next ch-1 sp, rep from to end, join to top of first st with sl st, do NOT turn.